Michael McFadyen's Scuba Diving - SS President Coolidge - Some Memories The following are some memories of the SS President Coolidge and her sinking. These have mostly been sent to me by relatives of the men concerned but the last one I found in a copy of an old magazine. I hope you find them as interesting as I did. Several times I sat with Dad and asked him questions about what the Coolidge was like and why he so much enjoyed the ship. From the conversations with him I was able to gather these notes and send them to you in this letter. I don't know if what he said will be of any help, but you are more than welcome to know how he enjoyed being on board the Coolidge and how the evacuation affected him upon the clash with the mines. Dad's copy of The Lady and the President by Peter Stone has excellent pictures and from a diagram included in the book he told me and showed me that he was in his quarters (a room with 9 bunks) on "C" deck, starboard side, bow end when it hit the mine. Dad was the ship's carpenter on this trip. He had been in the U.S. Merchant Marines since 1939, and had sailed on it [the Coolidge] prior to it being modified for carrying troops, in all he sailed on the Coolidge for at least 13 months. He found the Coolidge to be a beautiful ship. He commented that this ship burned a barrel of oil per minute for fuel. She sailed quite powerfully. At the time of the explosion he had just retired from his shift (he couldn't remember the exact time of the day). When the Captain blasted the siren he gathered up only the clothes on his back AND his Seamen's wallet. He recalls the escape from the ship a close one. The crew had had lifeboat drills, so he went to his assigned one. He also recalls that whoever the s-o-b was who was ringing the alarm bells was "ringing the hell out of the bells." Dad stated that he was helmsman in the lifeboat of more than 25 Merchant Marines and U.S. Army soldiers. His lifeboat had reached land when the Coolidge sank. He remembers being very sad- as though he had lost a good friend. His admiration for the Captain was maintained as he continued to sail with him on later voyages. Dad continues to defend the innocence of Captain Henry Nelson regarding his situation with the loss of the Coolidge. After the sinking, Dad returned to the United States (San Francisco), but as a passenger this time. The clothes he was wearing were some he had had to buy from the Red Cross. I remember his being mesmerized in 1988 while watching the broadcast of the National Geographic Explorer program [on the Coolidge]. It had been some 46 years since he had seen the inside of what was once a showplace of a ship. My parents moved back to Arkansas in 1949 and Dad went to work for the Cotton Belt Railroad (St. Louis Southwestern RR). Dad had pictures of most all the ships on which he sailed hanging on the wall of their bedroom. But there was this one ship's picture which was much larger and in color. I always knew it was special. It was a picture of a ship painted on silk, in a frame that measured at least 2 feet wide. We were always allowed to pull up a chair to climb on and look carefully at the pretty painting. As I got older I realized that this was the Coolidge, the ship that Dad always spoke about when he told his friends of the sinking. This was truly his favorite ship. And you know something, he remembered each year on the anniversary of its' sinking and would reflect on what a loss. Even now, at age 84 his eyes brighten and he shakes his head yes emphatically when I ask him if he was scared when they had to leave the ship. His speech is affected by a stroke now, but he still can say, "the Coolidge was a damn good ship." I also have a copy of the San Francisco Chronicle from December 4, 1942 in which Dad is quoted. The article has a photo of five of the crew at the Sailors Union of the Pacific office signing up for another ship after the Coolidge sank. I remember the Coolidge as being a beautiful ship. We left California and spent 17 days on the ocean before the sinking. Most of the time was spent either in the mess hall or playing cards and talking to the other men. Many of the men in the hold were very seasick and there was a terrible stench there. I was lucky enough to have a room with a bunk. When we crossed the international dateline many of the men were dunked in the swimming pool. There were no storms and the ship cruised along on a zigzag course. On the day of the sinking I was in my bunk. When the ship hit the mine I fell from the top bunk onto the floor. An alert was given and we were told that the ship was not going to sink. We were instructed to stay in our quarters. Then the ship hit another mine. This time an alert went out that the ship was going to sink and we were instructed to leave. I was on the port side. I made my way to the lobby and remember sitting in a chair. (I also remember seeing a painting of the lady in the photo on your web site [comment - this is, of course, the Lady. Whether Mr Schneider saw the actual figurine or a painting of it I do not know]). The ship pitched and my chair slid to the other side of the lobby. I made my way to the deck and jumped from the deck to a life boat with three men already on board. We started towards shore and watched the ship go down. I could see the men on the starboard side trying to get off of the ship. I saw one man attempting to be pulled out of a porthole, but he couldn't make it [perhaps this was Captain Euart - see Sinking Article - but he was trying to get out of a door, not a port hole - it could be an error of memory or perhaps the distance from the ship. It tends to confirm other stories related above about Captain Euart]. The water looked oily and I think there were some flames [I do not think this is correct as there is no other record of a fire and the photos do not show it]. The ship righted itself up and went down rear end first. It was an amazing sight, I wasn't far from the sinking ship. I could see the water whirling in a big circle as it went down. I lost all of my equipment and personal belongings, escaping with only the clothes on my back. This is about all I can remember. 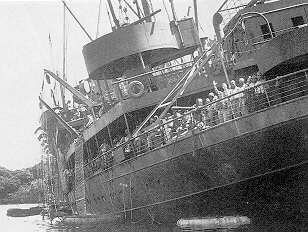 As a then 21 year old, I originally left the US in 1942 onboard a ship called the Mooremack Sea. I had been trained as a radio repair technician and part time aerial gunner on B-17s. This ship was enroute to Guadal Canal [Guadalcanal in the Solomon Islands] when a bent propeller shaft resulted in severe vibrations and a top speed of only 7 knots. We diverted to Figi [Fiji] and that is where I, along with about 500 others [more likely about 250], were transferred to the Coolidge. 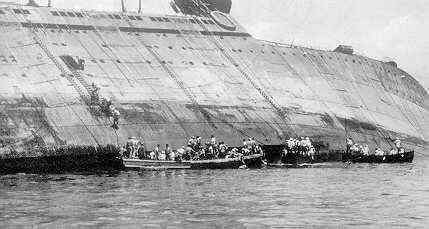 On that fateful day of the sinking, I was on deck and heard people yelling, "Torpedo .... torpedo .... torpedo!" The next thing I knew was that there was an ear splitting explosion that lifted the front of the ship up. Then when it settled back down into the water, there was yet another explosion [this tallies with the two mines but presumably the torpedo shout was either faulty memory - someone singing mines, mines - or a mistake by whoever was shouting out]. 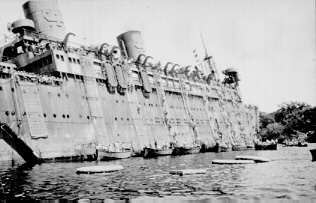 You mentioned in your writings [Michael McFadyen's Web Page on Coolidge] about the ship's captain running aground. This could be true but I have no knowledge of that ... "it was real hectic about that time." We were led to believe that the ship's captain had panicked and accidentally hit the mines. Like I said before, troops began stripping there [sic] combat gear preparing to abandon ship. Once I was on shore, some US Navy troops gave me two sets of clothing and shoes. One to wear while washing the other. A full issue of clothing came about one month later.